2-piece set includes 10-inch melamine plate and 6-inch melamine bowl. Dishwasher safe (top rack). BPA free. Great for fans of Star Wars. Set features characters from Episode VII (The Force Awakens). 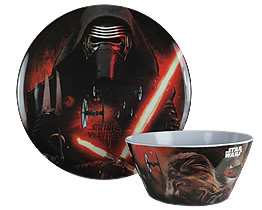 Plate features Kylo Ren. Bowl features Chewbacca, Rey, Finn, BB-8, and Stormtroopers.